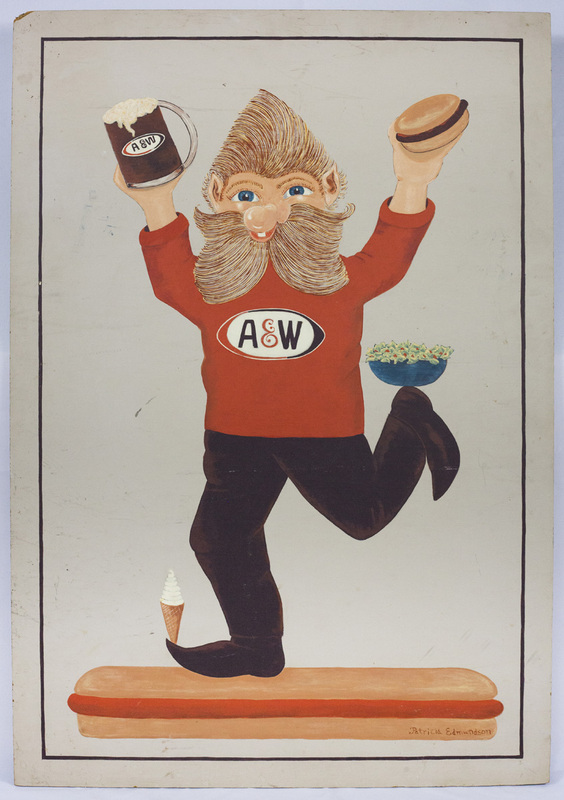 Trolls in Pat Edmundson’s signs, like this one for the local A&W Restaurant, were humorous reminders of the community’s Norwegian identity. In this sign, a troll balances on a long horizontal hot dog with a vanilla ice cream cone precariously perched at the tip of his pointed shoe. A bowl of salad is poised on the other upturned foot and a burger and a glass of A&W Root Beer rest in his hands. The troll sports the iconic orange A&W sweater. Edmundson here links a national brand of fast food with her unique, magical, fun-loving figures.